One of my Favorite 4×4 trips near Ouray Colorado. Every one always rants about Yankee Boy Basin and how cool it is and all. I say “whatever”. 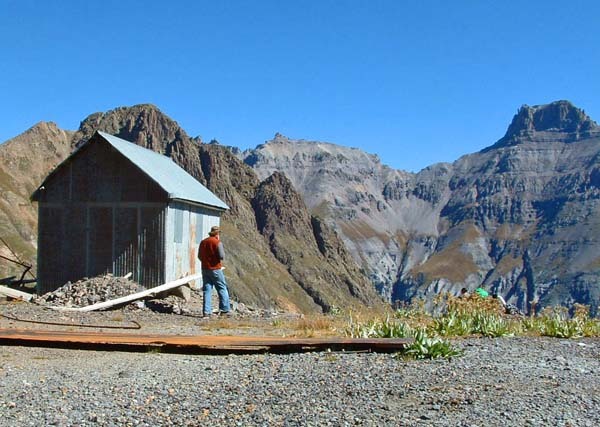 If you take the left instead of the right near the old Ruby City fork in the road, you will be heading into the Governors Basin/Sidney area, and will be about to experience some true San Juan high altitude adventure. IMHO! 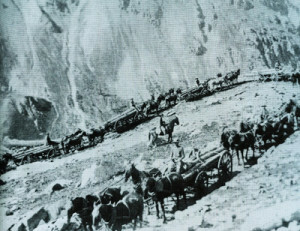 A load of pipe on the shelf road heading into Governors basin. This load is almost to the Virginius Mine, pretty gnarly! year round and in fact was the first mine to accomplish this as I understand. Wow, now that is dedication, or greed! Because of constant avalanche danger, the mine’s buildings were constructed in such a way that the avalanches were supposed to run over the top. It didn’t work! A slide in December of 1883 buried twelve men, killing four; and over the years several other men were killed or injured in slides. 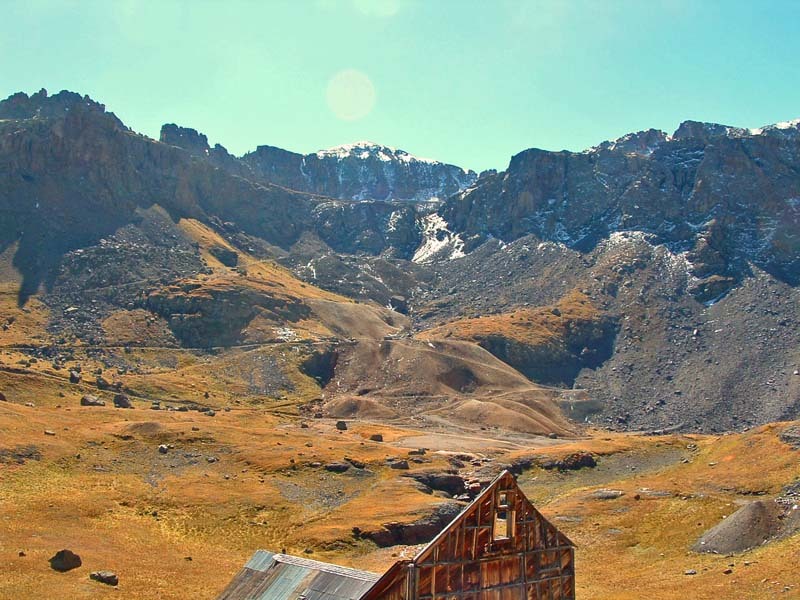 Looking at the photo below, which is looking up into the area that the mine was located, you know see that there is very little evidence it even existed! This is looking up to the spot that the Virginius Mine and all them buildings were located at one time! 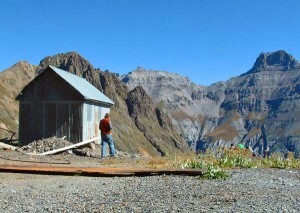 The Boarding House of the Mountain Top Mine and the Boulder that splits the Snow Slides and helped preserve this structure! not imagine how loud a Stamp Mill, or often called a Hammer Mill, would be in the confines of a mine adit. 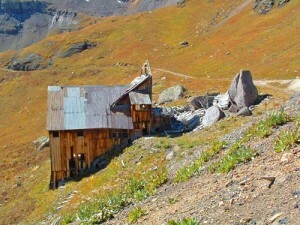 The other unusual feature of this mine had to do with its boarding house, not the fact that it was a good 3 stories, but the fact it is still standing, more or less, in the middle of Avalanche row. The reason is that they, as you can see in this photo, elected to build the Boarding House on the down hill side of a rather large boulder, that apparently splits the snow slides and clears the building. Pretty darn cool if you ask me! If nothing else these guys had some great views. Looking off to the north from the Basin you will see Stony Mountain, which resembles its name, with the Sniffles Range in the background. Not bad. There is also a spectacular close up view of the San Sophia Needle Ridge or Sophie’s Teeth, from the opposite side of what you can see in Telluride. The big notch, where Sophie had a tooth pulled apparently, was a passage for the trail to Telluride. 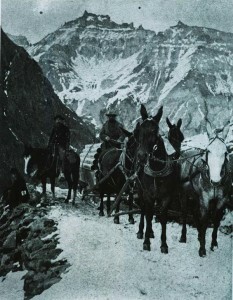 It is a lot closer to Telluride than to Ouray from here and most of the guys would take a trip to Telluride to get their fill on days off. I have a tale about some Texas lawyers and this basin. Once I was up here on a tour, I noticed these 5 guys running my way waving their hands. I waited till they reached my truck and asked them what was up. 4 of them pointed to the last gut and said, “This guy claims to know how to get us to Telluride, yet this is the 4th time we have ended up back in this basin.” I told them that if they climbed up to the notch in Sophie’s Teeth and then just went down, they would end up in Telluride, but also offered them a ride down as they looked desperate. After I parked the Rig for the night, I offered, if they paid, a ride in my own vehicle by highway to Telluride which they accepted. I learned during our trip that they where very concerned that their wives would be worried sick with them being so late, and this being before the age of cell phones, made it difficult for them to reach their worried loved ones. 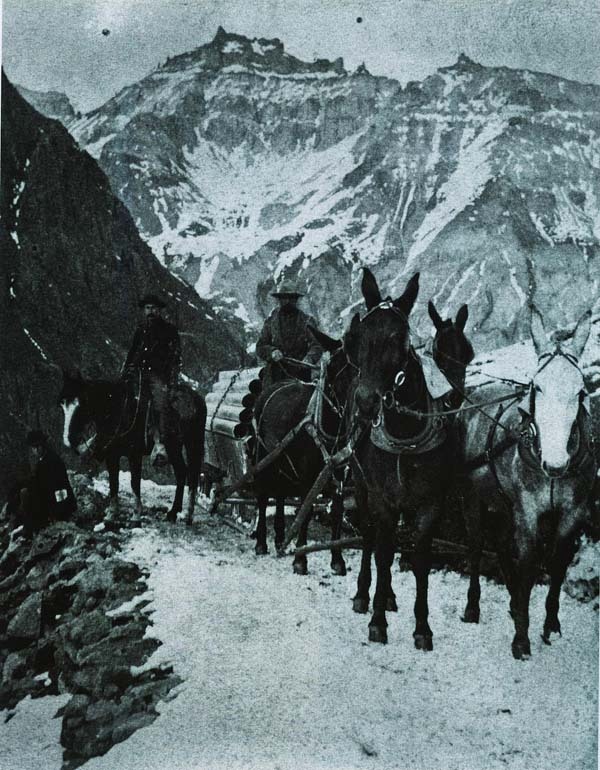 We make it to Telluride and we are having troubles finding their worried loved one as they are not at the hotel, so our search began. Really didn’t take too long to find them snookered at the Last Dollar Saloon not hardly aware that they even had husbands let alone they where missing 😉 . Hey I made some $’s and ended up with a interesting story! See Ya in the Hill’s! Clay Meet me on Alpine Paradises Face Book Page. Sophie’s Teeth and the short cut to Telluride! ← Whats with our Colorado Fall Colors?